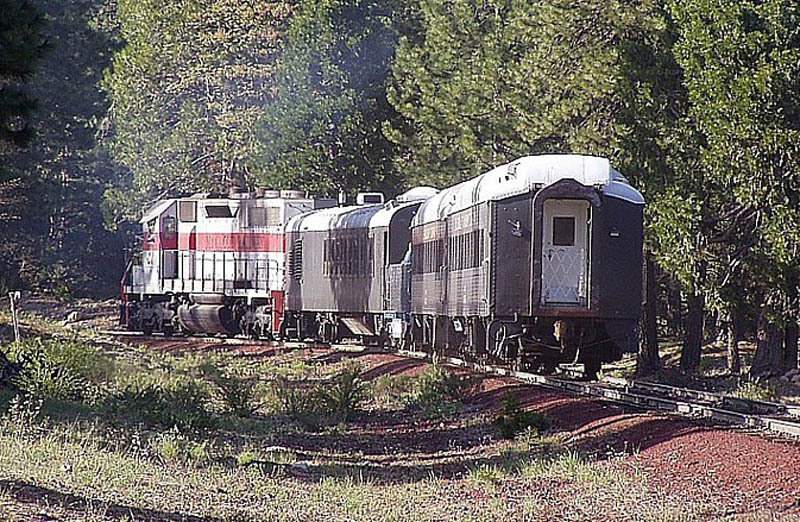 The Shasta Sunset Dinner Train entered operation in June of 1996 using McCloud diesels and several ex-Illinois Central heavyweight cars. The train proved to be enormously popular, expanding from one to two to four cars within a year. The train operated until January 2010 with the same four cars, but a lounge/power/concession car has been added to the consist. The shops coverted two more heavyweight coaches into state-of-the-art dancing cars in late 2002 and 2007. The new dancing car alternated on the consist with one of the open-air flats. A Mother's Day special behind the #38, posed on the Big Canyon Fill. Roger Titus photo. Thanksgiving Day 2003 special, powered by the #37, also at the Big Canyon fill. Roger Titus photo. The dinner train in the Signal Butte Switchback in November 2003. Roger Titus photo. The #37 leads the dinner train though a slow order 12 miles east of McCloud. Two loaded woodchip cars derailed at this spot, and they have not yet been set back on the rails. Roger Titus photo. The dinner train departing McCloud in May 2004. George Landrock photo. The dinner train is seen here behind the #38 waiting for departure time on a Saturday evening in May 2003.